America’s growth pattern of development has caused us to almost always jump in the car to get from A to B, even if it’s only 1 mile. The result has been much less walking and biking. 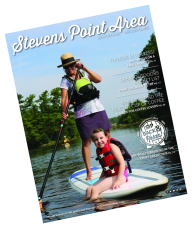 A lack of active transportation has taken a toll on our bodies, mental health, and pocket books, and Stevens Point is no exception. Join Trevor Roark, Chair of Stevens Point’s Bicycle & Pedestrian Street Safety Commission, as he breaks down the stigmas and barriers to walking and/or biking for transportation, providing an assist to active transportation for life. Joining him will be Kyle Kearns, Associate Planner for the City of Stevens Point, to dive deeper into topics of infrastructure, zoning, and the comprehensive plan.